All on 4 D Dental Implants are a great solution to enjoying a healthy, new smile, without having to worry about jaw re-structuring and bone loss that are common with missing teeth and traditional dentures. Experience a simple, permanent solution that only takes one day! Book your consultation! Why waste time and money going from one place to another for your dental implants when you can have everything done under one roof, in just one day? We offer our patients the convenience of a one stop shop along with the quality that comes from using the best dental professionals Canada has to offer. When you come in for your dental implants, we will be ready to give you the care and quality you deserve. At the end of your appointment, you will walk out with a beautiful new smile and teeth that look and feel just like healthy natural teeth. With proper care, your dental implants will be an investment that can last for a lifetime. People get dental implants for many different reasons, and the number of teeth they need varies greatly. People who lose teeth due to injury or periodontal disease may only need one or two teeth replaced. Those who have serious dental conditions, or who have been through intensive medical interventions like chemotherapy may need a full set of teeth on the upper or lower jaw. Multiple implants: This is a great choice for patients who need several teeth replaced, but who have healthy gums and want to keep their healthy teeth intact. Single implants: Popular with patients who have had lost a tooth due to injury or minor dental issues, this is a good alternative to uncomfortable flippers. What Are Dental Implants? There was a time when people who had lost their teeth for one reason or another had to use uncomfortable, ill-fitting dentures. Thanks to the advent of dental implants, there is now a safe permanent alternative. Cost Of Dental Implants No two people are the same. Even two patients requiring similar dental implants will vary in the preparation and treatment that is needed. The cost of your dental implants will depend on your individual circumstances. The All on 4 dental implant process offers patients an innovative option for obtaining a brand-new, permanent smile in one sitting. As opposed to spending a lot of time and money on individual implants for each missing tooth, now it’s possible to have only four implants secured for an entire prosthetic arch of new teeth. Instead of only enjoying one new tooth, patients can walk out of the office with a full, beautiful row of new teeth. A healthy smile doesn’t just feel good; it looks good too! All on 4 dental implants make it easy to chew and enjoy your favorite foods again, and you’ll never have to worry about discomfort or denture slipping. Being able to enjoy your favorite foods, talk to others confidently and feel good about your smile are all a part of improving your confidence and quality of life. In order to apply the implant properly, four titanium implants are inputted directly into the jawbone. This design allows you to maintain your natural jawbone structure, preventing any gaps that often have an effect on the look of your jawline. This permanent structure ensures a stable, well-shaped jaw that is long-lasting. The All on 4 implants are permanent structures, which means you don’t have to worry about slippage or using adhesives to secure them. Instead, your maintenance will simply require you to treat your teeth as you normally would, with daily brushing and flossing. For the most part, patients are able to eat whatever they want as soon as the procedure is complete. Some people choose to approach foods more carefully for the next few days, to ensure that their new teeth have settled properly. Your dentist will offer you their expertise for your unique situation. An anesthesiologist will be present during your procedure, to administer conscious sedation to you. This will help to relax you, block any pain while the procedure is in process, and will allow for a faster recovery than a full sedation. 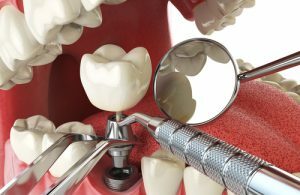 When Do I Schedule My Tooth Extraction? Typically, tooth extractions occur on the same day as the implant process; this helps to preserve your jawbone density. It is best to have the procedures take place as close together as possible, to ensure that the jawbone structure does not change. Generally, patients report feeling very little pain or discomfort during and after their surgery. In most cases, any discomfort should subside within three days. The actual implant procedure only takes a couple of hours. Tooth extractions occur first, and then the titanium inserts will be implanted, which take 1-2 hours per arch. After that, you’ll be fitted with temporary teeth that will be replaced with permanent teeth. The whole thing will only take a few hours, but you’ll be asked to come in a bit earlier in order to have your scans and X-rays taken care of. Is It Better to Get Four Implants, or Six? 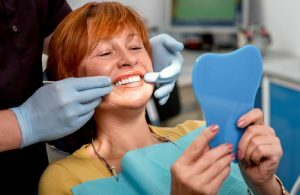 Every patient that comes in is unique, and the approach that works best for you will be discussed at your consultation. For the most part, going with more implants can require skin grafts or sinus lifts, which can cost more and often have a higher failure rate. On top of that, the more implants you have, the more your natural bone area will be reduced. Is It True It Takes 4-7 Months for Osseointegration to Take Place? Implants can take several months to properly fuse with your jawbone; fortunately for All on 4, the implants are connected with a titanium bar that increases stability immediately. This process ensures that your new teeth are stable and fully-functional right away. Do I Have a Say in How My New Teeth Look? Of course! During your consultation, you will be invited to go through our gallery of previous patients who had the same procedure done. You are also welcome to bring in photos of your ideal smile. We will do our best to recreate your perfect look without compromising the functionality of your new implants. You are going to love your new teeth, because they’re just like everyone else’s in that they are cared for in the exact same way. All you’ll need to do is brush them 2-3 times per day, for at least 2 minutes every time. As opposed to flossing, we suggest using a waterpik after every meal, to remove food from small spaces and between teeth. Similarly, head into your dentist twice a year for your regular cleaning, and you’ll be able to enjoy your new smile for years to come.